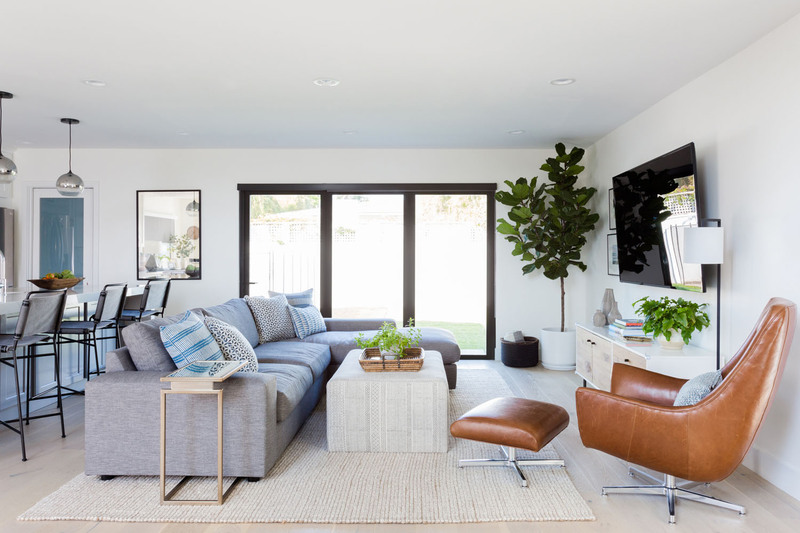 The Charles Swivel chair from Room & Board was a splurge, but the cognac leather was enough to convince the couple that it was well worth the investment. 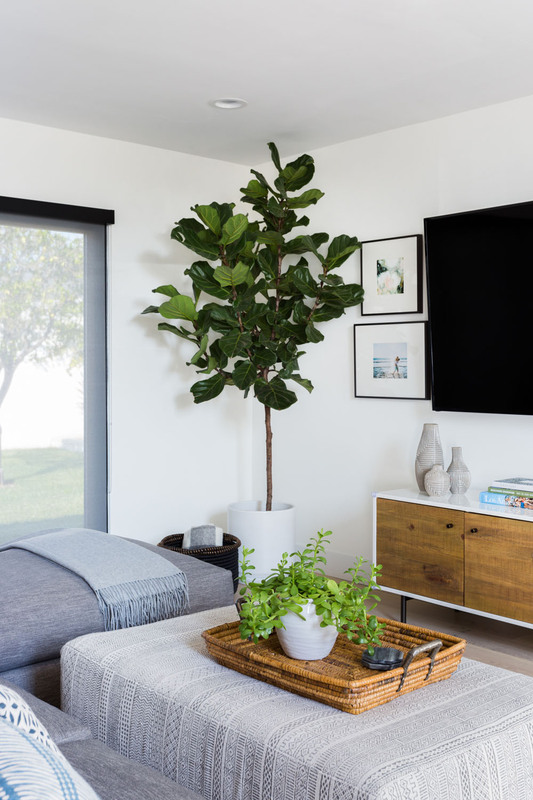 The west elm TV console was one of the first items that the couple purchased when they completed their home’s renovation. Marissa chose an upholstered ottoman by Kim Salmela as a way to make her clients’ home baby-friendly. The bright blue toned Walter G pillows were selected to mimic the colors of the Steve Thomas artwork in the dining room. 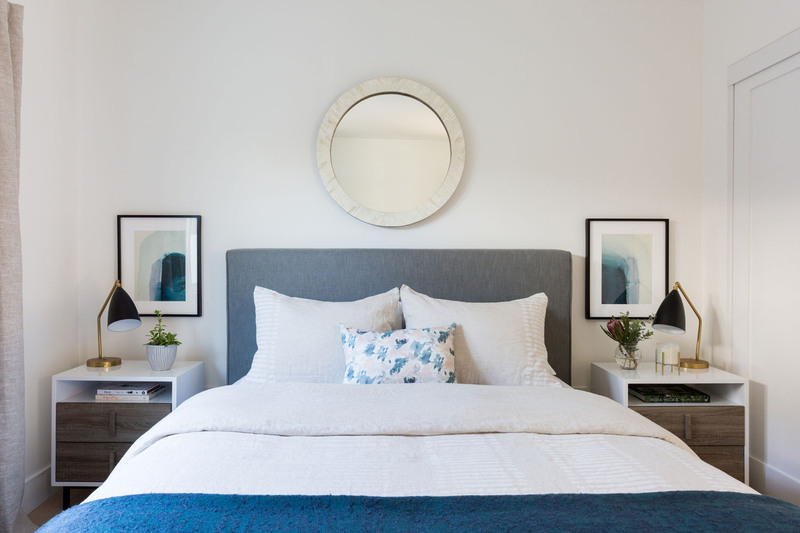 On the left, the Steve Thomas prints in floating frames served as the home design’s inspiration point for the color palette. 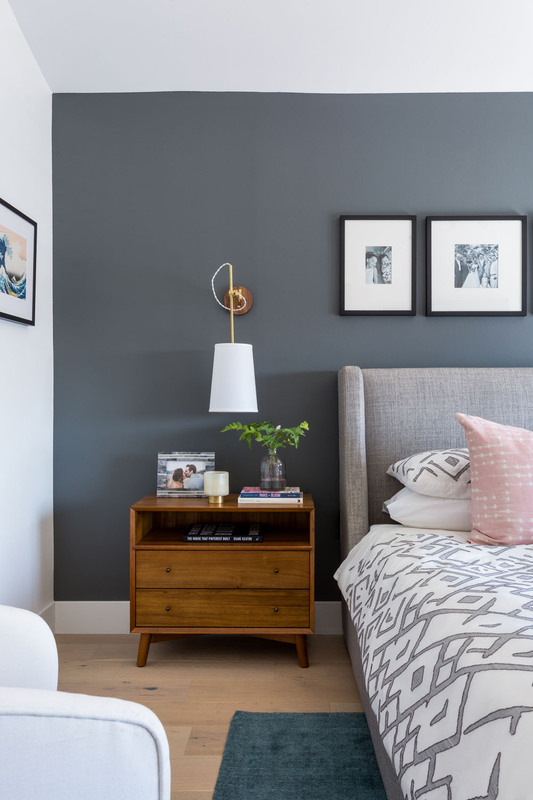 These vintage nightstands were originally too high. Marissa had 10 inches taken off of their legs to be the right proportion and height. 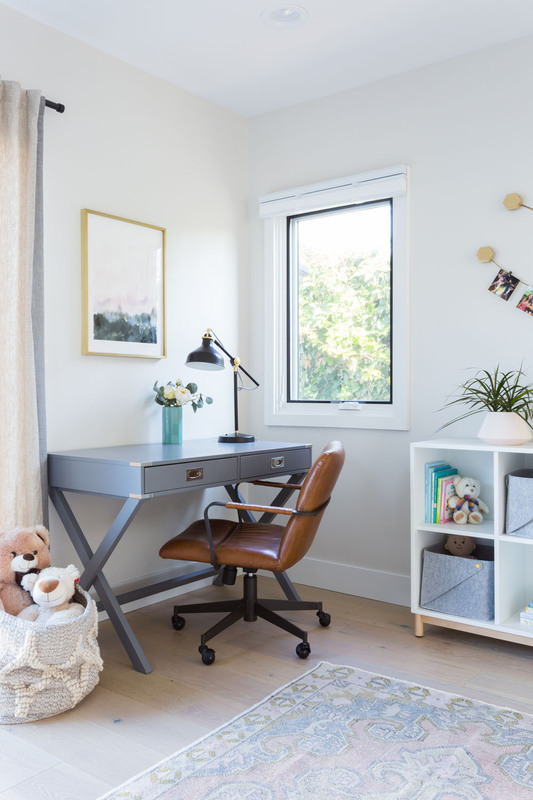 When Linda, a school teacher, and Ray, a realtor first bought their new home in 2016 in Mar Vista, California, they immediately began renovations and even welcomed their first child Mila. 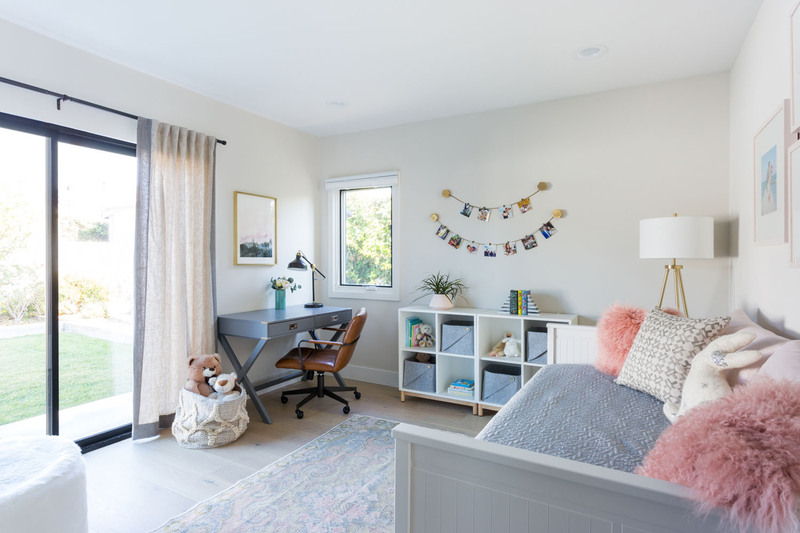 It wasn’t just the fact that they wanted to consider their daughter in the design of their new space that had them a bit stumped on their home’s decor but also their disparate tastes. Linda loved the coziness of traditional spaces and Ray had a penchant for contemporary design. 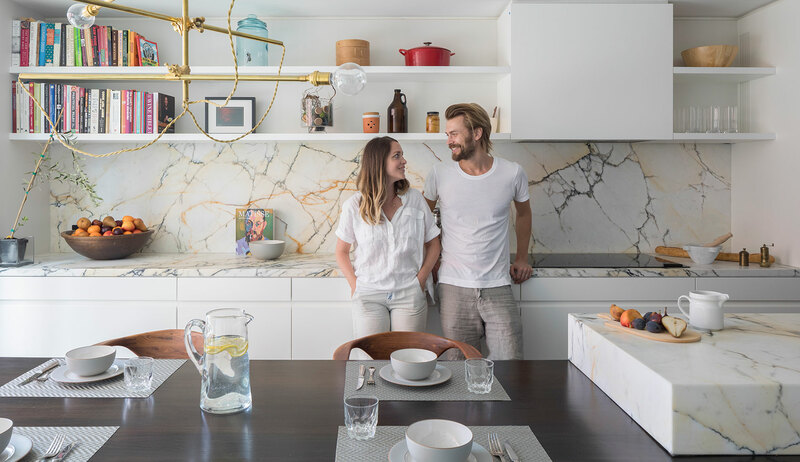 Wanting to have someone sort out the issue of what to do with some of their old furniture that didn’t work with the new layout and the handful of new pieces they had purchased, as well as their differing styles, they hired interior designer Marissa Cramer. “Linda grew up in the Northern California area of Moro Bay and Ray had his eye on a Steve Thomas vintage style illustration featuring California’s central coast. 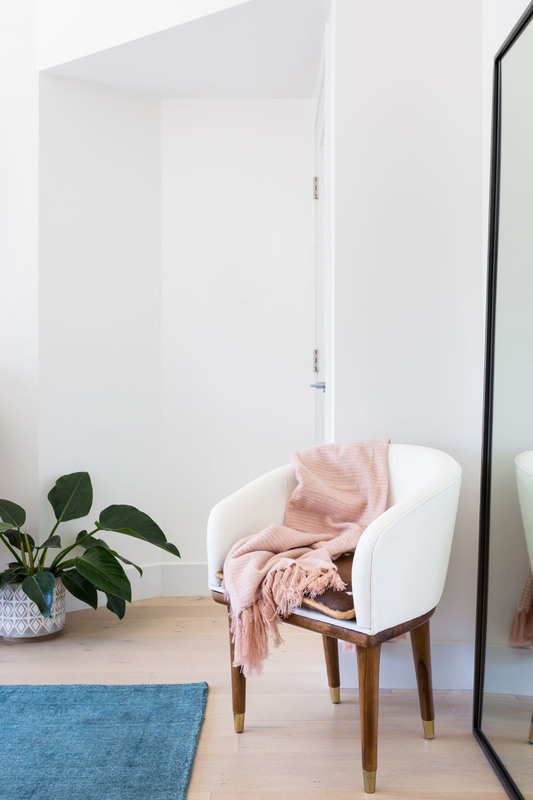 When I came on board, I narrowed down the selection to two canvas pieces that we had framed in wood floating frames,” Marissa explained. 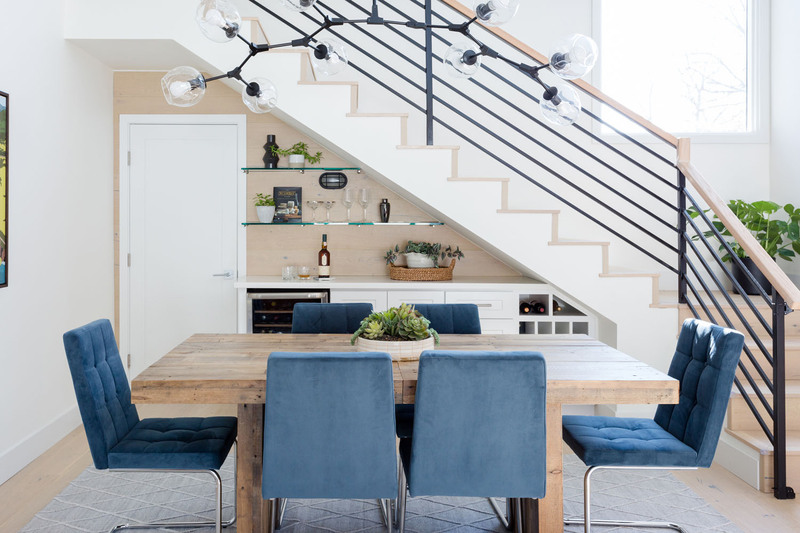 The colors of the artwork made up of grays and blues were the jumping off point of the design of their home. 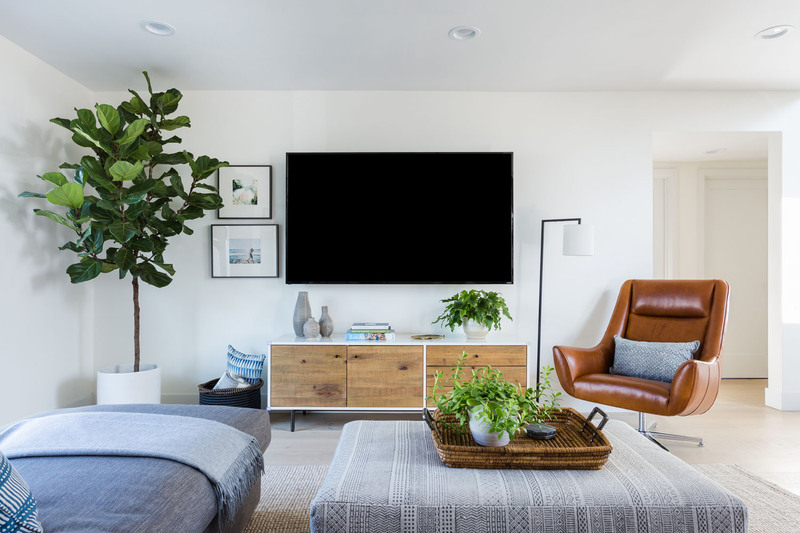 The couple had already purchased a bed for the new master suite from Room & Board, a dining table and TV console from west elm, and dining chairs from CB2. 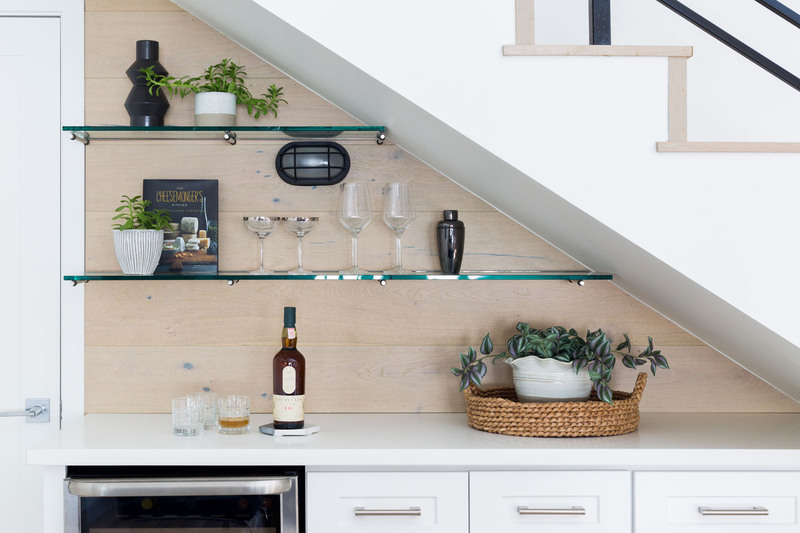 The home’s modern bones and the new contemporary pieces that the couple had already purchased served to satiate Ray’s love of a clean aesthetic. 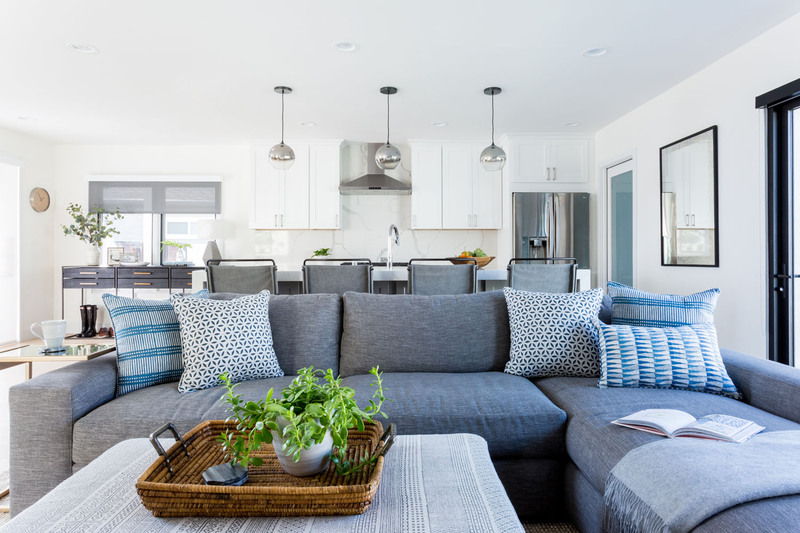 To bring in the coziness and traditional elements that Linda gravitated towards, Marissa selected a soft, linen sofa and upholstered Kim Salmela ottoman — which were also great for a home that included a new baby girl. 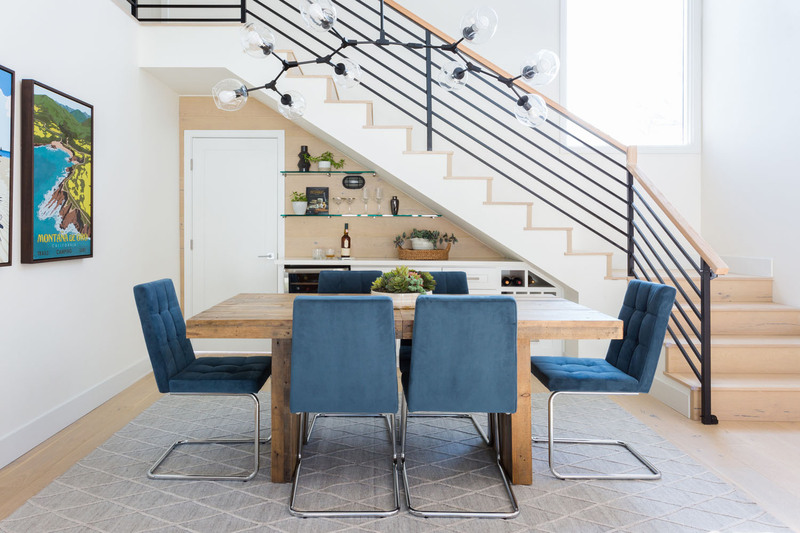 The gray lattice rug in the dining room brought in an additional feminine element to an otherwise clean-lined and masculine space. Where are those side tables from? 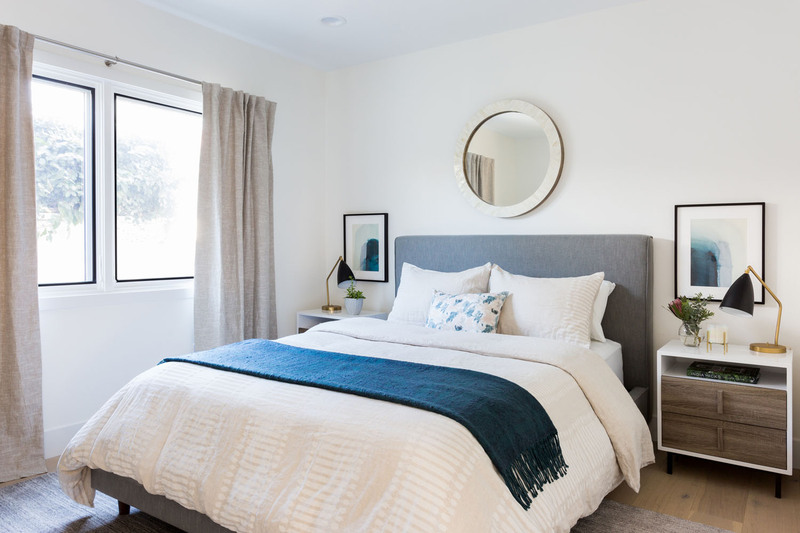 What is the grey wall paint color in the bedroom? I love it! 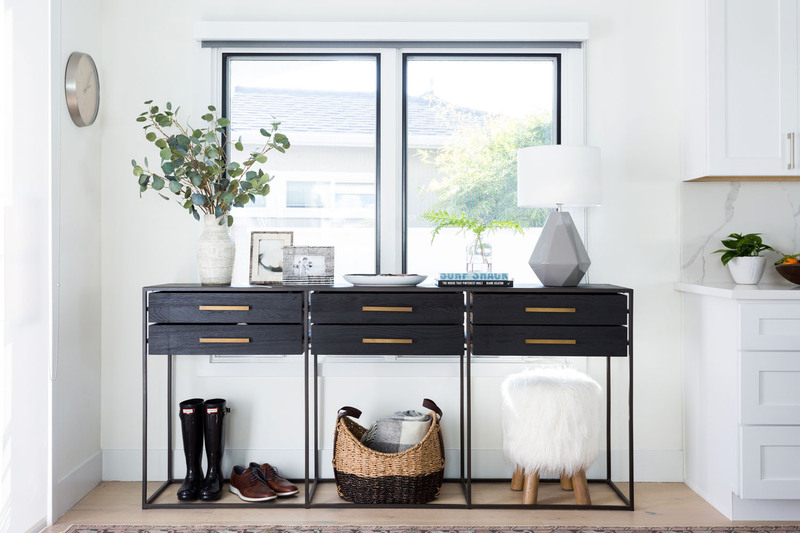 Where is that black console table from?